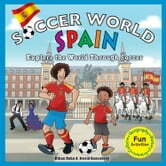 Journeying to the country that won the 2010 FIFA World Cup, this book explores the culture of Spain through the world's most popular sport: soccer. From watching an amazing game between world class rivals Real Madrid and FC Barcelona to exploring island volcanic landscapes and witnessing the many fiestas that are celebrated there, readers join professional soccer player Ethan Zohn on the experience of a lifetime. Activities generated from each chapter include learning a phrase in each of the different languages that Spain recognizes, making a sand-drip sand castle to understand the concept of surface tension, and creating a time capsule unique to a family's culture and era. Readers will also have the opportunity to research a real project in Spain through which they can give back and make a difference in this fascinating country.